Your financial needs change over time, from accumulating wealth to planning for retirement to making your money last as long as possible through retirement. One constant, however, is our ability to help you pursue your goals throughout your whole life. 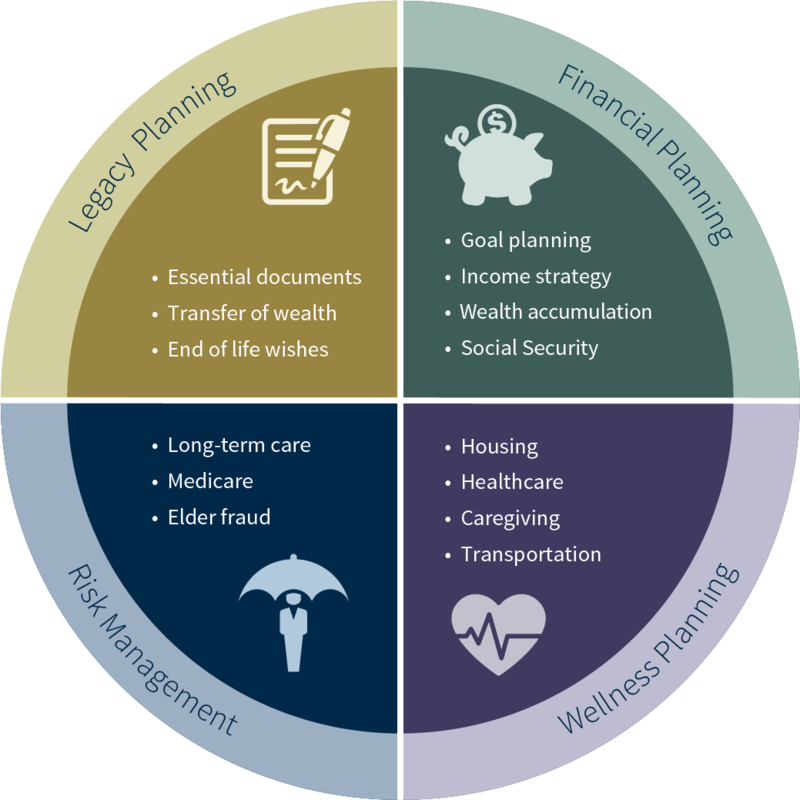 Through the full spectrum of financial services we offer, we can help you plan not only for a wide range of needs, but for the long succession of significant events that span your lifetime. As we live longer lives, there’s an awful lot to consider about your retirement years – from choosing the right Medicare plan to the possibility of a healthcare episode to finding a ride to the grocery store. Raymond James has partnered with several services to help make these challenges easier for you and your loved ones. Click on the tabs below to learn more about the available services. With sound planning, we can all get a little more out of life – spending more time focused on what’s important to us and less time worrying about finances. This sophisticated software program shows your full financial picture. It takes into account your specific goals, investment strategy, risk tolerance, spending and saving rates – and tells you the probability of achieving your goals. IMPORTANT: The projections or other information generated by Goal Planning & Monitoring regarding the likelihood of various investment outcomes are hypothetical in nature, do not reflect actual investment results and are not guarantees of future results. Results may vary with each use and over time. Your health and your finances are intertwined in complex ways. Plan ahead and consider the care you and your loved ones might need. A concierge health service, PinnacleCare helps you manage a healthcare episode. PinnacleCare maintains relationships with top-ranked medical centers across the country and works with you to find the best treatment, schedule appointments, coordinate seeking a second opinion – even ensure an accurate diagnosis. Broadspire helps you plan for the largest financial factors in retirement: housing and healthcare. Broadspire will assess, recommend and facilitate strategies for staying in your home as you age and other care needs associated with aging, from minor home modifications to finding the best memory care facility. You’re working hard to achieve success. Safeguarding your health and wealth is critical to ensure your quality of life in retirement. HealthPlanOne helps you navigate the complexities of Medicare by comparing options and finding the most cost-effective plan for you, while assuring appropriate coverage for your preferred providers, doctors and medications. EverSafe seeks to protect you from financial fraud by using a proprietary algorithm to monitor your accounts for unusual activity. Alerts are sent to you and those designated as trusted contacts. Leaving a legacy entails much more than leaving an inheritance or charitable gift - it’s important to pass along celebrated traditions and cherished values to those you love. Everplans enables you to organize important information - from a will to a favorite family recipe - and end-of-life wishes, which can be shared with trusted family and friends. Everplans guides you through the step-by-step process, helping ensure your family has a full understanding of your life and wishes. We understand the challenges business owners often face. Most important, we recognize your business is unique. Working with you as a partner in your success, we'll take the time to understand your goals and help you address a wide variety of needs, including asset protection, cash management and capital needs assessment, employee retention programs, insurance, financing, business valuation, and succession plan documents and funding. The rewards of providing uncommon vision and leadership can be significant, but with them often come unique challenges and risks, such as highly concentrated stock positions. We can help you with many different executive transactions, including employee stock ownership plans, stock option strategies, restricted securities, rule 144 executions, 10b5-1 sales plans and hedging and monetization for concentrated equity positions. In addition, we can assist with share repurchase programs, corporate cash management, executive benefit platforms, estate planning and retirement programs. We offer financial guidance for important matters facing today's families, such as the support of aging parents, special-needs family members and domestic partners, as well as college planning. Funding a child or grandchild's higher education can be a personally rewarding use of your wealth. We can help you provide for this opportunity with investment vehicles such as 529 College Savings Accounts and Specialized Trust Vehicles. Philanthropy can bring personal satisfaction, enabling you to support causes and organizations that matter most to you. It can result in significant tax advantages, as well – including income tax deductions, reduction of capital gains taxes, and lower estate taxes. We can help tailor a charitable giving plan for you that can include a charitable trust, donor advised fund, private family foundation, community foundation or outright gift. Since insurance helps protect you in case of accident, illness, disability or death, it plays a crucial role in your comprehensive financial plan. Through Raymond James, we can provide a wide array of quality insurance alternatives that can offer an important layer of safety for you, your family, your business or your organization. We can help you build a protective cushion with life insurance and disability insurance, business overhead insurance, and liability insurance including umbrella coverage and key person insurance. In addition, we can also help preserve your estate with long-term care insurance and combine protection and tax-advantaged growth opportunities with annuities. Asset allocation has been shown to be the most important single determinant of overall investment performance and risk. * Choosing the right mix of asset classes also can reduce portfolio volatility significantly. We make asset allocation a key component of our investment strategy, selecting a mix of asset classes that reflects your financial objectives, time horizon and risk tolerance. *Asset allocation does not guarantee a profit or protect against a loss. Family wealth is often concentrated in a single stock, either inherited or earned during a successful business career. If you're in this situation, there are many options available beyond simply selling the stock. Although reducing the risk of a concentrated equity position can be complicated, we can provide a variety of solutions that can hedge, monetize, diversify or transfer the position while managing the tax implications. We take a tax-sensitive approach to financial planning and work with you and your other professional advisors to help minimize the impact of taxes. By developing and implementing strategies to lessen or shift current and future tax liabilities, we can improve your prospects for meeting your financial objectives. In addition to impacting your life today, prudent tax planning can play a large role in the amount of wealth you will be able to someday transfer to your heirs. A rewarding aspect of wealth is being able to share it with others. Working with your tax and legal professionals, we can help develop a plan that enables you to maintain your lifestyle now while building a financial legacy for the future. Whether it's providing income for a spouse, educating children or grandchildren or leaving money to your favorite charity, proper estate planning can ensure that your assets accumulated over your lifetime are protected and preserved for the use you have intended. Through our affiliate, Raymond James Trust, N.A., we offer a full array of trust structures, including charitable-giving tools that may also feature tax advantages. Whether your goal is to minimize estate taxes, help ensure you have the funds you need down the road, provide for a loved one or spell out exactly how you want your wishes to be carried out, we can help. We can collaborate with your accounting or legal professional to help ensure that important documents and matters are addressed, including wills and living wills, durable power of attorney, healthcare proxy, asset titling, estate tax funding strategies, family dynamics/family meetings.